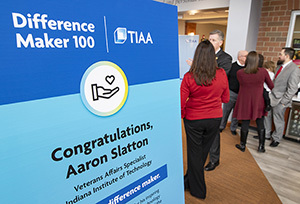 Indiana Tech and Teachers Insurance and Annuity Association (TIAA) hosted a reception today to recognize Aaron Slatton, a Marine Corps veteran, member of Indiana Tech’s Military and Veteran’s Services team, and TIAA Difference Maker 100 honoree. Slatton is among 100 extraordinary individuals TIAA, the leading provider of financial services in the academic, research, medical, cultural and government fields, is recognizing for devoting their lives to improving the world and shaping a brighter future for us all. Slatton was chosen for his work to establish a Student Veteran Group at Indiana Tech and spearhead activities to bring awareness to the unique abilities of former service members. The group is making a difference by helping veterans in need. Its fundraising, including a popular car show on campus, has helped build tiny homes for homeless vets and supported vets suffering post-traumatic stress disorder. In celebration of TIAA’s 100th year of serving those who serve others, TIAA is recognizing 100 people, like Slatton, who work for a nonprofit and are making significant contributions in their community or the world. TIAA, the leading provider of financial services in the academic, research, medical, cultural and government fields, is awarding each Difference Maker 100 Honoree with a $10,000 donation to support the nonprofit organization through which they make a difference. Slatton’s award will be donated to the campus Student Veteran Group to help establish a veteran-focused resource center at Indiana Tech. For more information about Slatton and the TIAA Difference Maker 100 program, please visit TIAADifferenceMaker100.org.